Wales' largest onshore wind farm has generated electricity for the first time. 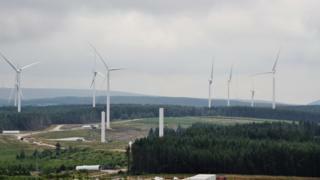 The £365m Pen-y-Cymoedd farm is being built between Neath and Aberdare by Swedish developers Vattenfall. The company said the breakthrough was "one of the biggest boosts this decade to delivering Wales' green energy targets". The 250 megawatt, 76-turbine scheme is set for completion early in 2017. Lesley Griffiths, the Welsh Government's Cabinet Secretary for Environment and Rural Affairs, said the development was "great news". "Supporting the development of more renewable energy projects is a key priority for the Welsh Government and this marks progress towards our goal of reducing our greenhouse emissions by at least 80% by 2050," she said.